"This simple yet scrumptious recipe has a nice kick and is a house favorite. Delicious!" Mix sour cream and lime juice together in a large bowl; season with salt and black pepper. Reserve about half the mixture in another bowl for serving. Mince half the jalapeno pepper; save other half for later. Toss cabbage, green onions, and minced jalapeno half in remaining sour cream mixture until slaw is well mixed. Heat olive oil and remaining jalapeno half in a large skillet over medium heat; swirl oil to coat skillet evenly. Season tilapia fillets with salt and pepper. Pan-fry fish strips in the skillet in 2 batches until fish is golden brown and easily flaked with a fork, 5 to 6 minutes. Discard jalapeno half. Heat tortillas in the microwave on high until warm, 20 to 30 seconds. 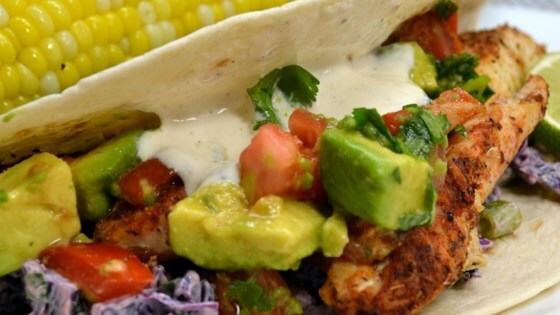 Serve fish in warmed tortillas topped with cabbage slaw, reserved sour cream mixture, and cilantro. These were excellent! Healthy and different. They cooked much faster for me. Soooo good and easy!!!! I added cilantro and jicama to the slaw and it was delicious! I served this to my family with black beans and Mexican rice on the side. Super filling and yummy dinner!